Studying the topic related to God’s mother, it always leads to many incredible discoveries. I never stop wondering how obviously the knowledge of her true role is reflected in the spiritual development of a human. Virgin Mary is worshipped all over the world. In many countries there are stories about the miraculous appearance of God’s mother. In this article, let's look into one of those events, which took place in the XVI century in Latin America. The miraculous image of the Virgin of Guadalupe is the most worshipped shrine in Latin America. Each year about 14 million people come to worship the image of God’s mother. According to the beliefs, the way to the shrine must be done on foot, and the last 100 meters - on knees, with a prayer in heart. The main stream of the believers come from December 9th to 12th, when Mexico celebrates the Day of the Holy Virgin Mary. According to the legends, many miracles were performed on that land by Virgin Mary. It is said, that she stopped an epidemic that claimed people’s lives in the years of 1736-1737, in Mexico City. In this respect, Pope Clement XII proclaimed Mary of Guadalupe the patroness of the city in 1737. Later, four more popes proclaimed Mary the patroness and protectress of New Spain (1754), Latin America (1910), Philippines (1935), and then (1999) the Saint patroness of all American people and the Star of Evangelization. It is believed that the Virgin Mary is the patroness of unborn children. This information becomes especially interesting when we regard it as an associative example. After all, according to the legends of various spiritual teachings and religions, a human is born when he is united with the Creator, when he becomes an angel, the enlightened one or reaches Nirvana, etc. The point is that the Guadeloupean shrine attracts the attention of not only the believers, but also the researchers. The first scientific study of the image of God’s mother was carried out in 1666. Among the participants of the study were historians of the Aztec culture, artists, and doctors. In the course of the work, they were gathering memories and evidence of the older generation of inhabitants in Mexico City and surrounding villages. In 1756, a book-report, "The American miracle" was published. The publication appeared as a result of the study of the image of Mary held in 1751 – 1752 by the commission of artists. The research was directed by Miguel Cabrera . But the most impressive discoveries in the study of the Latin American shrine began in the twentieth century, with the creation of computers and digital information processing methods. Let’s study the legend of the appearance of the image of God’s mother, and then look through the amazing discoveries and find out what message Mary has left for the future generations. The information about the legend can be found in the book called Nican Mopohua. The book was written in Nahuatl (the Aztec language) in the middle of the XVI century. The book explains, that during the period from December 9 to 12, 1531 (old style calendar, and new style calendar - December 22, the day of winter solstice) the Virgin Mary appeared to an Indian, Juan Diego Cuauhtlatoatzin, four times. The first appearance of God’s mother took place on Tepeyac Hill near a pagan temple of the goddess Tonantzin. In the morning of December 9, the Indian saw a bright light from which appeared a beautiful girl in shiny clothes. She spoke to Juan in the language of the Aztecs and introduced herself as the Virgin Mary. The girl asked the Indian to tell the Christian priest her wish - to build a temple on this site, where help would be found by each person who was looking for it. The bishop, Juan de Zumárraga did not believe Cuauhtlatoatzin’ s story. The Mother of God appeared to the Indian for the second time with her request saying that it was the wish of the Mother of God. Zumárraga asked to prove Mary’s miraculous appearance. And on the way home the Indian saw the Virgin Mary for the third time, who told him to come to Tepeyac Hill in the morning and get a sign. In the morning (December 12), Juan did not go to the hill but to the priest as his uncle was dying. God’s mother appeared to Juan Diego for the fourth time saying that his uncle was in good health and sent him to the hill for the proof for Zumárraga. It turned out that a formerly desert land was now covered with blooming roses. And all that was in a cold December morning! God’s mother helped the Indian to gather flowers and wrap them in a cloak. When Juan Diego came to the bishop and the roses fell to the floor from the opened cloak, everybody who saw it knelt down, and on the Indian’s cloak was the image of the Virgin Mary. The next day, the Indian brought the priest to the place mentioned by God’s mother. And Juan Diego’s uncle said that Mary appeared to him too, instructing how to call her miraculous image - Our Lady of Guadalupe. Finally instead of the destroyed temple of the pagan mother goddess (lunar deity), a temple of God’s mother was built. It is believed that the word "Guadeloupe" comes from a misspelled Aztec word meaning - "The one who crushes the serpent." This information is very interesting, if you know what kind of knowledge has been put at all times in the concept of victory over the serpent, who was also called the Guardian. Interesting information about the Guardian, as well as the ancient formations in the human brain (the pineal gland, the hypothalamus, the pituitary gland) can be found in the third part of the book "Birds and stone" by Anastasia Novykh. Going back to the origin of the word "Guadeloupe", there is another version of the interpretation: "The one who banishes that one who devours us." And again, it’s an interesting point, as in many countries God’s mother is considered to be the defender and the helper of the people who lead their spiritual way. It is said that after the construction of the temple, the local population began to accept Christianity voluntarily: almost all the inhabitants of Mexico (8 million people at that time) accepted baptism during 6 years. The rapid process of evangelization happened because of the symbols in the miraculous image. Although the facial features of God’s mother is not typical to Indian, but the symbols in the image were clear to Mexican residents of that time. Thus what symbols did the Aztecs see in the image of Mary? The explanation of the Immaculate Conception of God’s mother (one of the main principles of Christianity). This is reflected with the help of Mary’s long loose hair (symbol of virginity) and pregnancy symbol - a black belt, tied above the waist. The ends of the black belt have a trapezoidal shape, which indicates the change of the old for the new. For 10 years, after the capture of the Aztecs’ capital by Spanish conquistadors, a lot has changed in the life of the population. We can see light around God’s mother. This is interpreted as if she obscures the sun, thereby showing that she is stronger than the former pagan deity representing the Sun and war. Although I would interpret such an image in a different way. Firstly, we can say that this is a light of her energy (here comes to mind the Kirlian effect), as well as that saints and angels are often depicted in illumination. Secondly, in ancient times an oval represented energetic space around a human physical body. When describing the spiritual practice "Pyramid", "AllatRa" book explains that this space (which is limited to four human aspects) may vary from critical 7 cm to 1 m. In the third place, so it can be shown that God’s mother is a conductor of Allat creative powers. Perhaps the number of rays of the light contains information about the universe. By the way, you can also count them up and write your options in the comments. The Virgin Mary’s hands are joined in prayer. This gesture is considered to be a representation of the fact that she is praying, and therefore she is not God. Here I would also add that this gesture might mean her prayer for people, her concern for human spiritual rebirth. The image of God’s mother contains a four-leaved flower Nahui Olin, which means "A Flower of the Sun". It is believed that this flower is the most important symbol in the image of God’s mother for the Indians. In Aztec culture, it reflects the fundamental understanding of existence: the center of the universe, four sides of the world, the life-giving energy of the sun, full life, endless movement. It is explained that when seeing Nahui Olin on the clothes of the Virgin Mary, the Indian knew that she was carrying the Lord in her bosom. I also suggest to regard the interpretation of the symbol from the position of indigenous knowledge. This image of the flower reminds a diagonal cross with a circle inside. For me the information about the meaning of the sign, its variations, given in the book "AllatRa" has become a real discovery. I will give you just one quote, and those who are interested to know more, should not be lazy and look into this unique encyclopedia. “If the equilateral cross was a symbol of a common person, then the diagonal cross (the turned cross) and its variations (often with a circle in the centre) referred to the Personality which is moving along the path of the Knowledge and which is aware of the sacred information about the human being and the meditative practices on the four Aspects. I emphasise, the person who has the Knowledge, but the way he uses it (with which dominant in consciousness) is his personal choice. But most often the symbol of the diagonal cross (or its variations) pointed in the sacred texts at the Knowledge about the energy structure of man, his Aspects, and interconnection with dimensions”. “An equilateral diagonal cross with a circle in the centre is a symbol of the Knowledge about the four Aspects of the man and the Soul. The diagonal cross is a symbol of progress in cognition and a conditional division of space into the fields (zones) of influence of the Aspects; the circle is the designation of the Soul. The interpretation of the pattern of the symbol is shown in “seal” type”. There is one more interesting symbol on the clothes of God’s mother. It is an eight-leaved flower. According to the information from Internet sources, it symbolizes the joining of Venus to the Sun - the union of two major gods in the pantheon of American Indians. I noted for myself that the comparison is a transfer of knowledge, "the meaning of the spiritual symbol of the divine Lotos (plan) and the creating Allat (implementation of the plan)" (p. 549, "AllatRa" book). Just in ancient times, that knowledge was transferred through the worship of male and female deities in pairs. And the eight-leaved flower recalled the eight-pointed star symbol, which shows who God’s mother is. “Moreover, the greenish-blue colour was typical to this creative divine feminine hypostasis. In the mythology of different peoples it embodied the elements of water and of the feminine cosmic origin. This is a special colour which indicates certain achievements in spiritual practices. I’ll tell you more about it later. And now I will just note that even in the traditional view of the Chinese people, the green and blue segment of the colour spectrum is a single whole and is marked with the hieroglyphs that combine the meaning of “green” and “blue””. At the end of the examination of the Image symbols, I will note the thing that I have not seen in studies posted on the Internet, but which is clearly evident. It is the crescent with horns up that is Allat sign. By the way, this symbol as well as the stylized symbol "AllatRa" known to people since ancient times is often found in the icons of God’s mother. As you remember, the Virgin Mary’s temple was built on the ruins of the temple of the mother goddess, the goddess of the moon - Tonantzin. This suggests the argument that this place is probably not so simple. If we recall the history, many Christian temples were built on the site of pagan ones, which were usually located in the so-called places of power. But the sign of the crescent with horns up is a " symbol of a person, who spiritually broke free during his or her lifetime", as well as of Allat creating powers, about which you can read more not only in the book "AllatRa" but also in the scientific report on physics with a focus on general public, i.e, it is written in simple language. When talking about Mary’s predecessor in the land of the Aztecs - the goddess Tonantzin, God’s mother is said to have softer nature, as during worshipping Tonantzin there were human sacrifices. Yet, the true meaning of human sacrifice was the victory over their animal nature (read more in the book "AllatRa", p. 714). 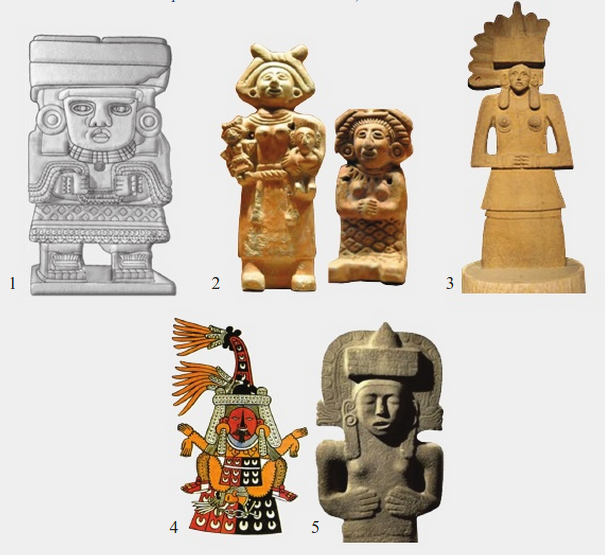 It is worth mentioning that Tonantzin was also often depicted holding a baby. And for a long time the Indians called God’s Mother in the name of mother goddess. Such a natural transition of the local population to the Christian faith reminded me of the formation of Orthodoxy in the Slavic territories in the times of Yaroslav the Wise (the times of positive sign activation that gave rise to the unity and spiritual outburst among the population of the ancient state), where the faith was also based on the veneration of the creating feminine principle. They also replaced pagan holidays with the days that corresponded to certain cosmic cycles. It is interesting that previously the day of Mary, which is celebrated in Mexico on December 9-12, had the "new fire" ritual. In fact, the old custom has remained the same in nowadays: a fire lights up from the candles in the basilica and then is spread throughout the country. It still remains unclear for scientists how the image of the Virgin Mary was imprinted on the cloth, as during the studies neither traces of primer and varnish, nor brush marks were found out. A German chemist Richard Kuhn, who analyzed the image in 1936 was struck with the absence of pigments of natural or synthetic origin in the painting. It was found that the colors and the shades of the image were chemical compounds and their molecules were bound with the material itself. Where there are no molecules of colours and there is no image. In 1946, researchers identified the cloth material. It turned out that the cloak of the Indian was made from Agave plant - an ephemeral material that preserves its form not more than for 20-30 years. But the image itself is already almost 500 years old, and it has been preserving its original form, despite the absence of the protective covering from the influence of the environment for a long time. It has been found out that the material of the Virgin Mary’s image is not affected by moisture, bacteria putrefaction , fungi, insects or dust. This phenomenon still can not be scientifically explained. Later the Mexican biochemists Roberto Papacis and Ernesto Pallares defined the species of agave to be Agave popotule. In 1979, during the study of the Image scientists from the University of Florida came across the phenomenon of "iridescence", which could not be reproduced artificially. Jody B.Smit and Philip Callahan studied the icon in infrared lights and noticed that the colours changed at different angles. The position of stars in the cloak of God’s mother was of great interest to researchers. The astronomer Mero Hernandez Illeskar together with his colleagues from France discovered that the stars reflected the location of the constellations over Mexico on December 22, 1531. But! They are reflected as if they were observed not from the planet, but from the center of the solar system. Mary’s head is crowned with the constellation "Corona Borealis", you can see the constellation of "Virgo" around her heart as well as the constellation of "Leo" and the star Regulus (from the Latin "prince") around her bosom. The most amazing discoveries have been made during the study of the Virgin Mary of Guadalupe’s eyes. And to make such a discovery was possible due to the development of technology that is interpreted as a message from God’s mother to living humanity nowadays. In 1929, Alfonso Marche made the first discovery. Studying the negatives, the photographer saw a figure of a man in the Virgin Mary’s right eye. Years later, a group of researchers headed by Javier Torroella Bueno found Purkinje-Sanson phenomenon in God’s mother’s eyes. The phenomenon is typical to the eyes of a living person. The miraculous image of God’s mother provoked the interest of a Peruvian scientist Dr. of informatics Jose Aste Tonsmann. He studied the icon using the method of digital image processing, which had previously been used only in space exploration. The work lasted for about 20 years. And in 2001 the scientist published the results of his research. Jose Aste increased the size of the pupils by 2,500 times. The size of the pupils itself was 7 mm. In the enlarged image of the Mary of Guadalupe’s eyes, the researcher found 12 figures. Among them was identified Juan de Zumárraga - a young man and bishop’s translator, as well as Juan Diego Cuauhtlatoatzin while opening his cloak. Interestingly, the deformation of the image corresponds to the refraction of the eye cornea, and the size of the figures corresponds to the fact as if it were a photo of what Mary saw. One of the proofs in favor of the fact that the image is not human-created is the detalization of the figures in Mary’s eyes. Why, from the point of view of painting, was it needed to create such a unique precision of microscopic figures if icons are designed for the perception from afar and the human eye can not see such details? The answer to this question may be the further discoveries of Jose Aste. Tonsmann noted the presence of several smaller figures unrelated to the overall composition in the center of the pupils. Subsequently, the scientist concluded that thus a family portrait was depicted. Jose Aste emphasizes this fact. After all, to see microscopic human figures in the eyes of God’s mother was possible only with modern science achievements. Therefore, the message left in 1531 was waiting in the wings. And the scientist believe that this message is a reminder of how important family is. Here I would note that in fact all the people of the Earth is a big family, we just need to realize it and become a real one whole. The temperature of the image is that of a normal human body temperature - 36.6 degrees. The image has a pulse - 115 beats per minute, which corresponds to the frequency of child's heartbeat in the womb. During the ophthalmic analysis, the phenomenon of reflection was discovered - the eye retina in the image reacts to the light. Interestingly, such an effect can not be created with modern methods of painting. The hands of God’s mother are of different shades. That was seen as a sign of unity between different races. The paints used in the creation of the icon have never been found on Earth. And NASA experts are planning to continue their studies of this amazing image. God’s mother appearance in 1531 was prompt support for the people in Latin America. After all, at that time usual human life was being ruined: the state was captured, the supreme ruler was dead, temples fell into ruins. And then there appeared a silver lining in the form of God’s mother. What’s the use of my describing the image of the Virgin of Guadalupe in such details (perhaps even as much details that few people have read the article thus far)? It is clear that when a person comes up to a sensorial perception, then he or she does not need scientific support of what he or she is sure about and really feels. But the fact is that the mind is constructed in such a way that it needs facts. A confirmation of the information from the book "AllatRa" are the facts that reveal scientific research, but they can not explain it, prove that there is something more, something that lies beyond the bounds of the material world. The information we get is of great help in self-improvement; it works as counter argumentation. When a person begins to increase the inner strength of the Spirit, he or she really feels support coming from the spiritual world and her Conductor – God’s mother. “Even now there is a legend about one of the saints. When he died and raised to the Kingdom of God, he began to look for Virgin Mary among the saints in order to bow before her and to thank her for all the help she gave him and other people during his life. But he didn’t find her in the Kingdom of God and then asked the saints about where she was. In reply the saints said that he won’t find her in the Kingdom of God since she is still on the Earth and helps the people in need”. In my opinion, in the miraculous image of the Virgin of Guadalupe there is a hidden message for modern people, which calls for unity, the true unity based on the spiritual values. I remember the words of the "Unity" programme where it says that people will receive additional support from the spiritual world in this case. “Look how we are surrounded by facts that we do not understand—they thrust themselves upon us but we neither see nor hear the great things hidden in their faint outlines and awaiting discovery”. Очень интересная статья. Анализ и сравнение фактов позволяет воспринимать сюжет более полно, включая описанную информацию в усвоенные ранее знания. Все больше убеждаюсь, насколько мир вокруг нас разнообразен и не познан, с точки зрения восприятия человека. И учитывая то, что материальный мир является лишь отражением частички Духовного - то как несоизмеримо прекрасен бесконечный мир Бога. Обычно лунными называют таких богинь в чьем изображении присутствует знак похожий на месяц. А это ведь знак Аллата, который есть и в изображении Девы Марии Гваделупской. Скорее всего Тонанцин и Дева Мария Гваделупская-одно и то же высшее духовное существо. И ведь храм построили на том же месте силы. Получается боги не исчезают, а просто их начинают называть и изображать по-другому. Мне статья очень понравилась! Спасибо! Очень интересно и главное еще раз показывает, что Мария чистая Проводница Любви Всевышнего! о еще одном Чудотворном Образе Марии, Матери всего здесь! Огромная благодарность за статью! Читалась на одном дыхании. Женские божества ацтеков: (1) ‒ Чальчиутликуэ ‒ богиня пресной воды, озёр, морей и рек, мать Сенцон-Мимишкоа (звёзд северной части неба). (2) ‒ Тонанцин («Наша мать») ‒ богиня-мать, персонификация земли и лунное божество. (3) ‒ Тоси («Наша Бабушка»), её атрибутами были предметы, необходимые для прядения и ткачества. (4, 5) ‒ Богиня плодородия Тласольтеотль ‒ одно из древнейших божеств Мезоамерики, восходит к «богине с косами». Ацтеки, вероятно, заимствовали её культ у хуастеков. Отличительные признаки богини ‒ носовая вставка в виде полулуния, головной убор из перьев перепёлки с куском ваты и двумя веретенами. Спасибо. Замечательная статья. Постепенно приходит понимание, что дева Мария не относится к какой-либо религии , а открыта и помогает каждому человеку , идущему по духовному пути мли ищущему этот путь. Иисус как-то спросил своих учеников, за кого они Его почитают, то есть кем считают. Ученики отвечали, что за Учителя. И лишь Мария, поняв, что в тот момент вопрос исходил от Сущности Его, ответила «Ты — Иисус, Сын Бога». И тогда Иисус сказал ей: «Блаженна ты, Мария, потому что не плоть и не кровь открыли тебе это, но Отец Мой, сущий на небесах. И Я говорю тебе: ты — есть Магдала Церкови Моей и врата ада не одолеют её». Именно с тех пор Марию стали называть Магдалиной. И это отнюдь не потому, что она была из города Мигдал-Эль. Просто в арамейском языке magdala означает «башня». Для посвящённых людей «Магдала Церкви Иисуса», «Башни Шамбалы», «Столпы Веры» — это схожие понятия, означающие особых людей, которым открывают и доверяют знания Шамбалы. В разные времена, на разных языках этих людей называли по-разному, но суть от этого не меняется. Древние славяне, к примеру, именовали их «Вежи», что означало «Столпы Знания», то же что и «Башни Шамбалы». Не случайно, даже на сегодняшний день слово «Вежа» сохранило в своём обозначении у разных народов такие разные на первый взгляд понятия, как «башня», «знающий», «сведущий». Так что если говорить о Марии Магдалине, то она была именно тем ближайшим учеником, кому Иисус не только доверил тайные знания, но и вручил то, что сегодня люди именуют «Граалем», а, по сути, адаптированную формулу Первичного Звука. Это и есть те самые «ключи от Царства Небесного», о которых Иисус говорил: «И дам тебе ключи от Царства Небесного; а что свяжешь на земле, то будет связано на небесах; и что разрешишь на земле, то будет разрешено на небесах». Спасибо за интересный материал. Открыла для себя много нового!!! Очень вдохновляющая статья! Действительно, даже для скептиков есть неопровержимые доказательства в существовании Мира Духовного. Вот он рядом, он помогает нам!